Upanayana sanskara ceremony in progress at Nepal. Typically, this ritual was for 8 year olds in ancient India, but is now practiced for all ages. Upanayana (Sanskrit: उपनयन upanayana-) is one of the traditional saṃskāras (rites of passage) that marked the acceptance of a student by a guru (teacher) and an individual's entrance to a school in Hinduism. The tradition is widely discussed in ancient Sanskrit texts of India and varies regionally. The sacred thread (yagyopavita or janeu) is received by the boy during this ceremony, that he continues wearing across his chest thereafter. The upanayana was restricted in many medieval Indian texts to the upper three of the four varnas (castes) of society — brahmins, kshatriyas and vaishyas. However, Vedic period texts such as the Baudhāyana Grihyasutra encouraged all members of society to undergo the upanayana, even (manual workers) shudras. Women were encouraged to undergo upanayana in ancient India before they started Vedic studies or before their wedding. Upanayana (Sanskrit: उपनयन) literally means "the act of leading to or near". It is an important and widely discussed samskara in ancient Sanskrit texts. The rite of passage symbolizes the leading or drawing towards the self of a child, in a school, by a teacher. It is a ceremony in which a guru (teacher) accepts and draws a child towards knowledge and initiates the second birth that is of the young mind and spirit. A boy during his upanayana ritual. The thin, yellow Yajnopavita thread runs from left shoulder to waist. Note the munja grass girdle around the waist. The peepal tree twig in his right hand marks his entry into the Brahmacharya stage of life. Upanayana is the rite of passage for the start of formal education of writing, numbers, reading, Vedangas, arts and other skills. The Upanayana rite of passage was also important to the teacher, as the student would therefrom begin to live in the gurukul (school). Upanayana was an elaborate ceremony, that included rituals involving the family, the child and the teacher. A boy receives during this ceremony a sacred thread called Yajñopaveetam that he wears. The Yajñopavita ceremony announced that the child had entered into formal education. In the modern era, the Upanayana rite of passage is open to anyone at any age. The education of a student was not limited to ritual and philosophical speculations found in the Vedas and the Upanishads. They extended to many arts and crafts, which had their own, similar rites of passages. Aitareya Brahmana, Agamas and Puranas literature of Hinduism describe these as Śilpa Śastras. They extend to all practical aspects of culture, such as the sculptor, the potter, the perfumer, the wheelwright, the painter, the weaver, the architect, the dancer, and the musician. Ancient Indian texts assert that the number of the arts is unlimited, but each deploy elements of 64 ‘‘kala’’ (कला, techniques) and 32 ‘‘vidyas’’ (विद्या, fields of knowledge). The training of these began from childhood and included studies about dharma, culture, reading, writing, mathematics, geometry, colors, tools, as well as traditions (trade secrets). The rites of passage during apprentice education varied in the respective guilds. The Upanayan in West Bengal, India. In Bengali Language it is called 'Paite'. In Hindu traditions, a human being is born at least twice — once at physical birth and second at intellectual birth through teacher's care. The first is marked through the Jatakarman sanskara ritual; the second is marked through Upanayanam or Vidyarambha rites of passage. A sacred thread was given by the teacher during the initiation to school ceremony and was a symbolic reminder to the student of his purpose at school as well as a social marker of the student as someone who was born a second time (dvija, twice born); he went about collecting fire wood in forest and food donations from villages on a daily basis. Many medieval era texts discuss Upanayana in the context of three varnas (caste, class) — Brahmins, Kshtreyas and Vaishyas. Several texts such as Sushruta Sutrasthana, however, also include Sudras entering schools and the formal education process, stating that the Upanayana samskara was open to everyone. The Baudhayana Grihya sutra in verses 2.5.8 and 2.5.9 states the teacher to "[l]et him initiate [to school through Upanayana] a Brahmin in spring, a Kshatriya in summer, a Vaishya in autumn, a Sudra in the rainy season; or all of them in the spring." The ceremony was typically performed at age eight among the Brahmins, at age 11 among the Kshatriyas, and age 12 among Vaishyas. Apastamba Gryha Sutra, in verse 1.1.1.27, places a maximum age limit of 24 for the Upanayana ceremony and start of formal education. However, Gautama Gryha Sutra and other ancient texts state that there is no age restriction and anyone of any age can undertake Upanayanam when they feel they initiate their formal studies of the Vedas. In some regions, in modern times, boys and girls undergo the tradition of Upanayana initiation when they start their formal schooling. In ancient and medieval eras, texts such as Harita Dharmasutras, Asvalayana Grhya Sutra and Yama smriti suggest women could begin Vedic studies after the Upanayana rite of passage. Girls who decided to become a student underwent the Upanayana rite of passage, at the age of 8, and thereafter were called Brahmavadini. They wore a thread or upper garment over their left shoulder. Those girls who chose not to go to a gurukul were called Sadyovadhu (literally, one who marries straight). However, the Sadyovadhu, too, underwent a step during the wedding rituals, where she would complete Upanayana, and thereafter wear her upper garment (saree) over her left shoulder. This interim symbolic Upanayana rite of passage for a girl, before her wedding, is described in multiple texts such as the Gobhila Gryha Sutra verse 2.1.19 and some Dharmasutras. Scholars state that the details and restrictions in the Upanayana ceremony is likely to have been inserted into ancient texts in a more modern era. Hermann Oldenberg, for example, states that Upanayana — the solemn reception of the pupil by the teacher to teach him the Veda — is joined into texts of Vedic texts at places that simply do not make any contextual sense, do not match the style, and are likely to be a corruption of the ancient texts. For example, in Satapatha Brahmana, the Upanayana rite of passage text appears in the middle of a dialogue about Agnihotra; after the Upanayana verse end, sage Saukeya abruptly returns to the Agnihotra and Uddalaka. Oldenberg states that the Upanayana discussion is likely an insertion into the older text. Scholars state that there is high likelihood of interpolation, insertion and corruption in dharma sutras and dharma sastra texts, and there are contradictory verses in it on Upanayana-related rites of passage. Kane similarly states, in his History of Dharmasastra reviews, that there is high likelihood of interpolation, insertion and corruption in dharma sutras and dharma sastra texts on Upanayana-related rite of passage. Patrick Olivelle notes the doubts in postmodern scholarship about the presumed reliability of Manusmriti manuscripts. He writes, "Manusmriti was the first Indian legal text introduced to the western world through the translation of Sir William Jones in 1794". This was based on the Calcutta manuscript with the commentary of Kulluka, which has been assumed to be the reliable vulgate version, and translated repeatedly from Jones in 1794 to Doniger in 1991. The reliability of the Manusmriti manuscript used since colonial times, states Olivelle, is "far from the truth. Indeed, one of the great surprises of my editorial work has been to discover how few of the over fifty manuscripts that I collated actually follow the vulgate in key readings." The "sacred thread" (Sanskrit: यज्ञोपवीतम् yajñopavītam or upavīta) is a thin cord, composed of three cotton strands. The strands symbolize different things in their regions. For example, among Tamil Hindus, each strand is for each of the three trinity of goddesses (Parvati, Lakshmi and Saraswati). The ancient Sanskrit texts offer a diverse view while describing yajñopavītam or upavita. The term upavita was originally meant to be any upper garment, as stated in verse 2.2.4.22–2.2.4.23 of Apastamba Dharmasutra or, if the wearer doesn't want to wear a top, a thread would suffice. The thread identified a person who is studying at a school or has graduated. The ancient Indian scholar Haradatta states, "yajñopavītam means a particular mode of wearing the upper garment, and it is not necessary to have the yajñopavīta at all times". The Gobhila Gryha Sutra similarly states, at verse 1.2.1 in its discussion on Upanayana, that "the student understands the yajnopavita as a cord of threads, or a garment, or a rope of kusa grass", and it is its methods of wearing and the significance that matters. The proper manner of wearing the upper garment or thread, state the ancient texts, is from over the left shoulder and under the right arm. The idea of wearing the upper garment or sacred thread, and its significance, extended to women. This is reflected in the traditional wearing of sari over the left shoulder, during formal occasions and the celebration of rites of passage such as Hindu weddings. It was also the norm if a girl undertakes the Upanayana ceremony and begins her Vedic studies as a Brahmavadini. The sacred Yajñopavītam is known by many names (varying by region and community), such as Bratabandha, Janivaara, Jandhyam, Poita, Pūṇūl, Janeu, Lagun, Yajnopavita, Yagyopavit, Yonya and Zunnar. The other Sanskrit term for it is Avyanga. There is no mention of any rule or custom, states Patrick Olivelle, that "required Brahmins to wear a sacred string at all times", in the Brahmanical literature (Vedic and ancient post-Vedic). Yajñopavītam, textual evidence suggests, is a medieval and modern tradition. However, the term Yajñopavīta appears in ancient Hindu literature, and therein it means a way of wearing the upper garment during a ritual or rites of passage. The custom of wearing a string is a late development in Hinduism, was optional in the medieval era, and the ancient Indian texts do not mention this ritual for any class or for Upanayana. Yajñopavīta contrasts with Pracinavita method of wearing the upper garment, the latter a reverse and mirror image of former, and suggested to signify rituals for elders/ancestors (for example, funeral). In Nepal a slightly different ceremony is held which combines 'चूड़ाकर्म' (choodakarma) (tonsure, shave the head) and Upanayana saṃskāra locally known as Bratabandha (Sanskrit brata = promise, bandhan = to be bound) It is held among the Bhramin and Kshytreya hill communities in Nepal. 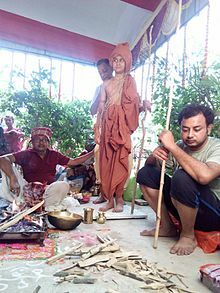 This Sanskara (rite of passage) involves elaborate Karma Kanda which involves the participation of entire family and a guru (teacher) who then accepts the boy as a disciple in the Guru–shishya tradition of Hinduism. Gayatri Mantra is given by the guru (teacher) to the sisya (student). This marks as an individual's entrance to a school of Hinduism.This ceremony ends after the boy goes for his first alms round to relatives and leave for gurus Ashram. Traditionally these boys were sent to ashrams with the gurus to learn in a gurukul system of education but in modern times this act of the boy doing for first alms round in town and leaving his family for gurus hermitage is done symbolically within the family and is later stopped by his maternal uncle (Mama) from leaving. The ceremony is called Munja / Munji or Mounji-Bandhana (lit. 'tying of munja') in the states of Maharashtra & Karnataka. This name finds its origin in the name of a grass called Saccharum munja (Bengal cane). This grass is used to make a girdle that is tied around the waist of the child. In Bengal, the girdle of munja grass is called "Mekhala". In Gujarat, Madhya Pradesh and in several areas of Uttar Pradesh and Bihar, the sacred thread is known as the "Janoi", "Janeva" or "Janeu". Wikimedia Commons has media related to Upanayana. ^ a b c Mookerji 1998, p. 174. ^ "A Village in Bihar, where Girl wear the Sacred Thread 'Janeu'". IANS. news.biharprabha.com. Retrieved 10 February 2014. ^ Shore, Amanda. "Miss". Retrieved 20 May 2014. Coward, Harold; Cook, Philip Hilton (1996). Religious Dimensions of Child and Family Life: Reflections on the UN Convention on the Rights of the Child. Wilfrid Laurier University Press. ISBN 978-1-55058-104-1. Mookerji, Radha Kumud (1998). Ancient Indian Education: Brahmanical and Buddhist. Motilal Banarsidass. ISBN 978-81-208-0423-4.